The perfect antidote to the relentless winter weather. Not only is this stock incredibly flavorful but it will also make your apartment smell ridiculously good – which I particularly like because usually when I have been cooking all day, by the time Chris gets home any good smells have melded and morphed into someone else’s elevator-landing dinner and before Chris can control himself his face contorts and an “ugh whats that smell” slips out. But not this time!! Victory is mine! 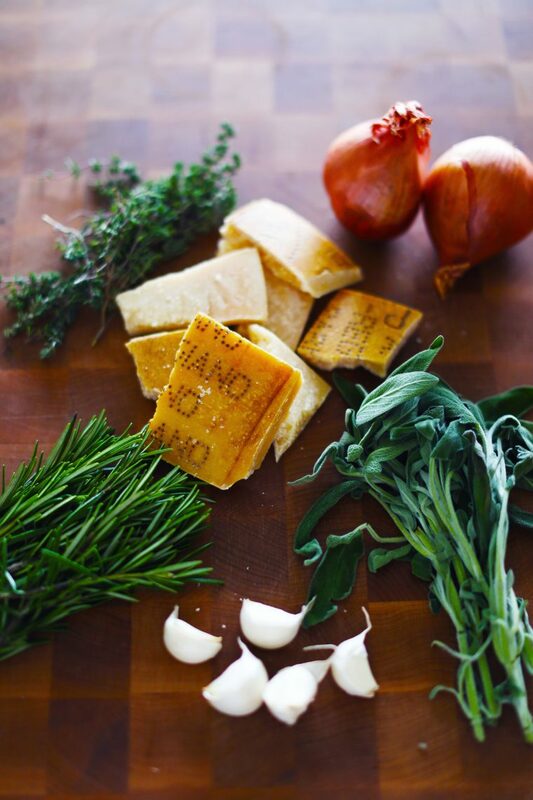 The Parmesan rind is every chef’s best kept secret – it imparts a depth of flavor that is savory and decadent and salty and sharp and so many other things we love. 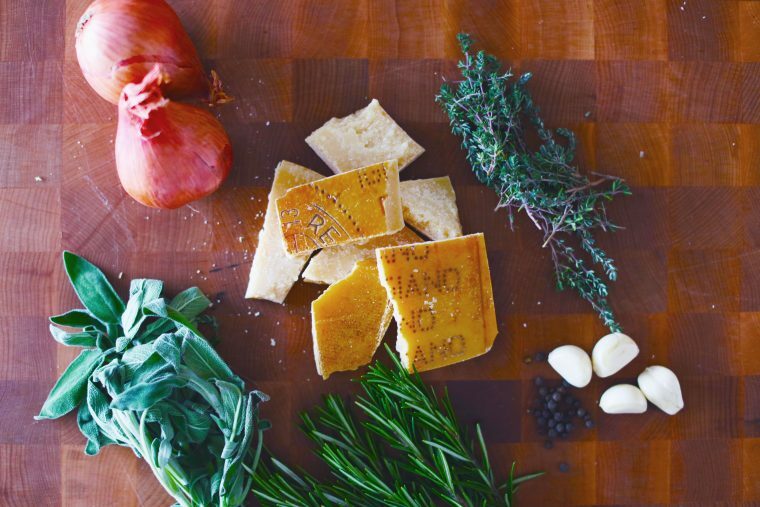 If you do not go through blocks of Parmesan on a regular basis you can either save the rinds as you go – placing them in a ziploc bag and keeping in the freezer until you have amassed a small collection – or Whole Foods sells packs of just rinds (or just ask at your store’s cheese counter). Use this in place of chicken or vegetable broth. I will be putting it in the Ribollita I make tonight but I also think it would make this Mushroom Farro even more delicious (pardon the terrible photos in these old school recipes!! yikes!). One last point – Parmesan is ideal for this stock but you can absolutely use other cheese – just make sure there is no wax coating on the rind. That would not be tasty. This recipe is really a very general guideline - use what you have or other flavors you like. Place everything into a large pot, bring to a boil and reduce to simmer for a few hours. Strain and cool. Store in the fridge or freezer.